In an effort to jumpstart real estate prices, the Obama administration has extended a key tax credit for first-time home buyers and “move-up” home buyers. The HR 3548 also offers more help for unemployed individuals as well as people struggling with mortgage delinquency. 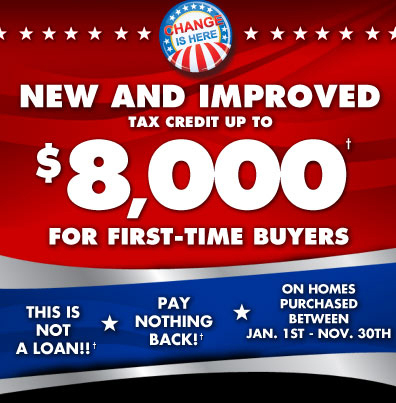 The $8,000 tax break for first time homeowners will be valid until May 1, 2010. Meanwhile, “move-up” buyers need to sign the purchase agreement before May 1, 2010 and then close the deal before July 1 for the tax credit to be valid. Bob @ Broker for You uploaded an informative article titled “Move Up Home Buyers Tax Credit”. The content is particularly beneficial for individuals who are looking to buy a better home for themselves or their families. For example, it lets you know how long you should have stayed in your current home in order to be eligible for it as well as other details. Alexis @ BV on Money wrote the blog post “6,500 Tax Credit for Home Buyers: Owners Have Good Reasons to Buy”. It talked about the main benefits of getting the tax break. Individuals who intend to buy a house in the near future should consider the credit because it is not everyday that a deal like this is available from the government. Jeff @ Good Financial Cents has an interesting article. The “$8,000 First Home Buyer Tax Credit is Extended and $6,500 Credit Added” post provides basic insights about what you can expect from the recently passed bill. He also cited the effects this bill will have on individual households and the economy in general. Holiday Spending – Should You Save Instead? Home Buyer Credit: Is It Going to Last? That was a good move for Obama, hope many aspiring home owners would benefit with this proclamation especially those who are struggling to have a home.